It can often be a difficult decision to file bankruptcy. While it does solve some immediate problems for your financial situation, it can have other unfortunate effects that last for years. 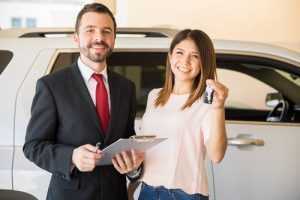 Applying for a large purchase like for a home or vehicle can be challenging. Due to your poor credit and having a bankruptcy on your record are red flags for lenders. However, there are car dealers who will take a chance on you and provide financing for a used vehicle that will meet your transportation needs. Be prepared by following these steps prior to applying for bankruptcy auto loans in St. Charles. Obtain your credit report from the 3 major credit bureaus before visiting the dealer. You are entitled to one free copy annually from FreeCreditReport.com. It is worth the small fee to additionally get your credit score. Correcting any errors can raise your score several critical points that can save you money on your interest rate. Examine your budget carefully. Along with the loan payment, consider fuel, maintenance and insurance costs. Even with auto financing after repossession, it is in your best interest to pay as much money down as you can. Dealers see this as a good sign of your ability to pay the loan can save you money. There are many auto dealers in St. Charles who will work with you. Recommendations from family and friends can be quite helpful. For bankruptcy auto loans in St. Charles and dependable used cars, call 5 Star Auto Plaza at (636)940-7600. Our inventory changes constantly. We are ready to serve you.